Freedom Rockz: Free @ Schwan's Recipes Yummo Alert! Free @ Schwan's Recipes Yummo Alert! They have a ton of delicious recipes on the Schwan's website. Although the recipes are with their products you can use your own frozen green beans etc to make the recipes. 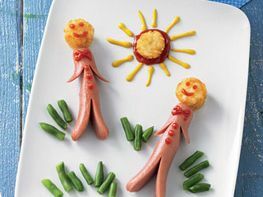 Some of the ideas are pretty good like the hotdog man above the kids would love that.